1. 10 Times Damsel in Dior "Did it for the Gram." 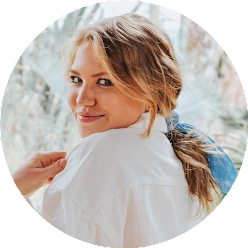 Jacey's post was not only so interesting to read and take a peek behind the scenes, but such a reminder of how Instagram's lens onto our lives really doesn't capture it all. 2. Madewell never has sales, and this weekend they are offering an extra 30% off all sale items! A few things that I love and are still available in multiple sizes: this ruffle skirt, these culotte pants, a pretty ruffle top, and classic buckle sandals. 4. How good are those home finds?! If you're looking for more inspiration, I did a part II of my small space decor post! 5. A visit to Hôtel de Crillon, please. 6. The before and after of this home is incredible. It was a beautiful home before, and now it's almost unreal. 7. I love this gingham and eyelet look on Blair. 8. ...I just love that polka dot scarf! 9. How to turn a dark basement into a dreamy home office. 10. One week until I'm back in NYC!